Originally from Puerto Rico, José “Joe” Sanchez grew up in Connecticut and was exposed to music from a very early age. A freelance musician for nearly four decades, Joe has performed at many national festivals, theaters, clubs and private events, covering a wide variety of musical genres. He has also been active as a session player, teacher and clinician. 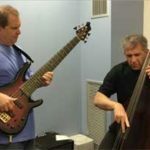 Joe studied bass with Matt Garrison, Lincoln Goines and John Patitucci and is featured on Victor Wooten’s Groove Workshop DVD. FBPO: Tell me about your musical upbringing. You were born in Puerto Rico, right? JS: I was born in Puerto Rico and I came to the states when I was 3 years old. FBPO: Do you come from a musical family? JS: Well, we always had music in the house. My mom always loved to sing. Growing up, in grade school, I was always in the plays, into the chorus, into singing, so I always had that interest in me. I would say my first major influence was Elvis Presley, singing along with his stuff when I was young. That really got me into music. FBPO: Where did you grow up after you left Puerto Rico? JS: In Connecticut. About an hour and twenty minutes outside New York City. FBPO: What attracted you to the bass? JS: I went to see some bands when I was very young and just something about the bass, just hearing it and feeling it, kind of made me gravitate towards the feel and the sound of it just grabbed a hold of me and I’ve never let go. FBPO: Were you playing any instruments before that? JS: I played a little guitar here and there – we had a guitar around the house – but nothing very serious until I got older. 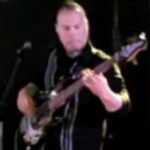 FBPO: You were 15 when you started playing electric bass? JS: Yeah, just around 15 years old. FBPO: Did you find yourself listening to the radio differently after discovering the bass? JS: Oh, definitely! No matter what was on the radio, I would always listen to the bass. 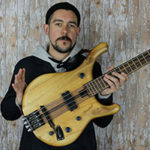 FBPO: Did you identify some bass influences, some bass heroes? Who were you paying attention to, bass-wise? JS: Bass-wise, back then it was very hard to tell because a lot of times they didn’t say who the bass player was. I found out much later who they were. The obvious ones were James Jamerson, which I never knew until later, obviously, was a real big one. Another one, through Elvis Presley’s music, because I’ve always been a huge fan, was Jerry Scheff. He’s one of my top players, something about the way he plays and locks in with Ronnie Tutt. FBPO: Jerry wrote an autobiography a few years ago. I read it a while back. It’s an interesting story. I don’t know if you’ve ever come across it. 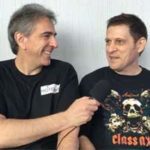 I interviewed his son, Jason Scheff, a few years ago. JS: I’m familiar with him. FBPO: James Jamerson, Jerry Scheff. Any others? JS: Oh, there’s tons of others! I can’t name them all, but Paul McCartney was another one. Then I got into jazz much later, when I got a little older. FBPO: Do you play upright too? JS: I do not play upright. I had one for a few years, but I wouldn’t call myself an upright player. FBPO: How did your career get rolling? What kind of stuff were you doing initially? JS: Initially, it was more rock & roll, doing everything from the Beatles to Zeppelin. FBPO: With local bands you mean? FBPO: During high school? After high school? JS: When we started gigging I was about 18. FBPO: Doing weddings and dances and things like that? JS: Actually, I was in the clubs I shouldn’t have been in, but I was in the clubs playing. 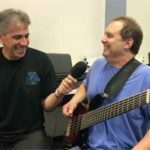 FBPO: You’ve done a lot of stuff with Victor Wooten. 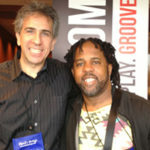 JS: Victor Wooten is a really good friend of mine. We’ve known each other since like ’97. I’ve done a lot of playing with him on the East Coast. 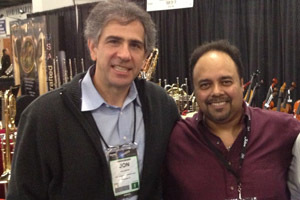 I got to play with him in some concerts and some clinics. He actually called me up to be on his Groove Workshop DVD, which I was honored to do. FBPO: What was that like? JS: On the Groove Workshop, the idea was to bring in some students from the Bass Collective. Victor has a certain way of teaching music like a language. He also breaks it down into what makes a good solo or a good phrase. FBPO: You have a very impressive list of accomplishments on your resume. Tell me about some gigs that you’ve had or some things that you’ve done that stand out as particularly meaningful or memorable. JS: Well, with Victor, obviously. Here in New Haven, Connecticut, at Toad’s Place. He had me play with him there. That was a really big thing for me in my life because I got to play with somebody that, musically, I admired and also he’s just one of the nicest guys. I’m sure you know him. He’s just one of the nicest people you want to know. JS: He’s also my friend, so that was really big for me. Also, I studied a lot with Matthew Garrison. Since Matt opened up the ShapeShifter Lab, I’ve been down there twice with my trio already and the first concert I played down there, actually, Matt came and played with me. JS: Yes! Juan and I have been friends for many years. He’s in Austria now. We were Skyping just before this interview. In fact, he says to tell you hello! FBPO: What’s keeping you busy these days, Joe? JS: Actually, a couple things. I’ve been playing with a local artist named Mia Fanali and her band, the Riff. That’s been keeping me very busy lately, along with teaching and composing. I’ve been composing a lot lately because I have some ideas I just want to get out and put them on a CD. JS: Oh, definitely. I want to make some kind of statement with it because it’s music that I really want to share. FBPO: Tell me about the music. JS: The music is difficult to categorize because at one point it can sound like fusion jazz, then it could sound like a smooth jazz tune or it can sound bebop-ish. It’s a mixture of music in my life and it’s just what comes out. FBPO: Where are you in the process? JS: I’m still in the composing stage. I have a little more than half of the CD composed. FBPO: You’re a big fan of Marleaux basses. JS: Yes! I first met Gerald Marleaux through one of my friends, Ariane Cap, whom I’m sure you know very well. JS: I played a lot of his fine instruments and there was something about this 6-string contra that really grabbed my attention. Not only is it beautiful – when you look at it, it looks like a piece of art – but it actually sounds incredible. And it plays beautifully on top of that. That bass really spoke to me when I played it. FBPO: How about the future, Joe? What else would you like to do, other than the CD project you mentioned? JS: Wow, there are so many other great musicians that I would love to have the opportunity to play with. And I want to just continue to grow and compose. That’s what I really love to do, share music. JS: I’ve been martial artist since I was 11 years old. That’s actually how Victor and I first started talking. Victor studied Wing Chun and we came to find out that both our sifus studied with the same grand master!